Hi again! Apologies for the lack of quantification in this post. It will be largely qualitative. I know how much everyone hates that. Last time we discussed the energy use of reusable vs. disposable cups, and showed that the reusable cups require a significant number of reuses before they break even in regards to energy requirements when compared to single-use cups. This time we discuss pollution and disposal. When factoring in the pollution from production and the space required for disposal, reusable cups become more attractive. Producing ceramic and glass cups is straightforward. It is only slightly more complicated than heating up dirt and making it into the shape you want. It takes a lot of energy to produce that heat, but few chemicals are used. There are some potential pollution issues associated with the dusts and powders used to create glass and ceramics, but proper techniques that are used in the developed world largely mitigate these. Making paper requires pulping of the wood. Paper can use a chemical or mechanical process for making pulp. The chemical process can release some pretty gnarly chemicals and volatile organics. Ever been downwind of a paper mill? Paper production produces quite a bit of pollution. The mechanical process produces less pollution and ultimately costs less, but produces a lower quality paper. Wax or plastic is often added to the cup to make it water-tight, preventing decomposition. As far as disposal goes, most of it ends up in a landfill. Styrofoam cups were manufactured with a method that produced CFCs for a long time, which rip apart the ozone layer. Emissions of CFCs were supposed to be arrested, so we didn't wreck our home planet. The process has since converted to HFCs; safer for the environment, but a significantly powerful greenhouse gas, with a per-molecule greenhouse strength about 1300x of CO2. Moreover, the production of Styrofoam releases volatile organic compounds. These ultimately help produce ground-level ozone and smog. We like ozone in the stratosphere, about 15km above our head, as it blocks harmful UV radiation from reaching us. We do not like it at the ground. It causes breathing difficulty and smog, and can contribute to rising asthma rates. In other words, Styrofoam production creates air pollution. When it comes times for disposal, like paper, most of this ends up in landfill. 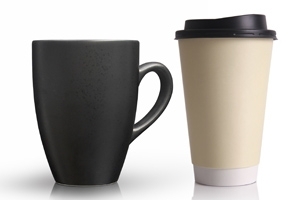 It is clear that the energy used to produce and clean reusable cups is the largest negative environmental factor, which, as discussed in the prior post, is mitigated after many reuses. The production of disposable cups creates pollution, and the disposal requires a significant portion of landfill space. These factors contribute to a lower number of reuses of reusable cups before an environmental break-even it obtained. This entry was posted in Environmental Blog Posts by Jason Munster. Bookmark the permalink. I'm confused. So what is better to use taking EVERYTHING into accounts not??? I read both your blogs. If you are concerned about both greenhouse gas emissions and trash, a reusable cup that you keep and use forever is best. It takes a long time for the extra CO2 emissions from production of reusable cups to offset the lower CO2 emissions of making styrofoam, but they will eventually and they produce less non-biodegradable waste.